Lakes release gas too. In the latest paper freely available from our RELATED project, we show that the vegetation in and around lakes can play an important role in influencing how much of the potent greenhouse gas methane is produced by microbes. The story, led by our former postdoc Erik Emilson, has been covered by BBC News. We recently featured in a terrific new documentary called What Trees Talk About. The film was shot in 2016 during our summer field campaign and is freely available online in Canada. When does saving nature make “cents”? Fifty football pitches worth of forest were apparently lost every minute between 2000 and 2012 according to a recent paper by Matt Hansen et al. And there is little reason to expect this to be different today. This tremendous pace of forest loss is mostly driven by the clearance of land for agriculture, yet comes at a tremendous cost to the other benefits that people obtain from forests, including carbon sequestration, water purification, and biodiversity. In a new primer for PLoS Biology – think tutorial more than review – we deliver an overview of the global challenge of reconciling forest conservation with land clearance for agriculture. We explain how the economic valuation of ecosystem services can provide a way to choose between allocating land to either conservation or development, highlighting a new paper in PLoS Biology by Roman Carrasco and colleagues. In their paper, Carrasco et al. test how different scenarios of global agricultural production might trade off against the multiple ecosystem services delivered by tropical forests. They find that the value of those services destroyed by deforestation exceeds the economic benefits of agriculture, except in a few regions if greater yields of high-value crops are eventually realised. Together, the analytical framework and results of Carrasco et al. should inform the spatial prioritisation of real-world interventions such as REDD+ and can help deliver better environmental and economic outcomes worldwide. Definitely worth a read! If evolution happened anew, what would the present-day plant world look like? That is, would the randomized processes that govern evolutionary change tell a different story? And particularly for plants which are sessile organisms, is the starting point of ‘who gets there first’ the most important of all? Priority effects – the order and timing of species arrival into local communities – can affect ecological community structure and functioning, with profound effects for species persistence and ecological interactions (Chase et al., 2000; van de Voorde et al., 2011). As such, the arrival of different species at different times can dramatically alter the evolutionary tapestry of any given system on ecological time frames, but also in evolutionary time. In particular, the diversification of early arriving species can pre-empt available niche space to prevent the establishment, dominance or diversification of species that arrive later on down the road. Béatrice Wedeux and David Coomes published a paper in Biogeosciences analysing how environmental factors and selective logging interact to shape the canopies of tropical forests. Using airborne laser scanning technology across a 750 km2peat swamp forest landscape in Borneo, the study reveals strong shifts in canopy height and gap patterns along environmental gradients linked to changing peat depth. In areas where logging roads were detected on historical satellite imagery, the canopy is lowered and has larger gaps, especially so on deep peat where tree growth is thought to be limited by low nutrient availability and waterlogging. The study identifies a close link between the height and the gap structure of tropical peat swamp forests at the landscape scale and reinforces the vulnerability of this ecosystem to human disturbance. The degradation of tropical peat swamps has been at the heart of climate negotiations in Paris, as emissions from fires in Indonesian peatlands over the last couple of months – exacerbated by a dry El Niño spell – approach the total annual emissions of Brazil (1.62 billion metric tons;www.wri.org). Airborne laser scanning allows the detection of openings at different height cross-sections of the canopies of old-growth and selectively logged forests. Read online: Wedeux, BMM and Coomes DA (2015) Landscape-scale changes in forest canopy structure across a partially logged tropical peat swamp, BIOGEOSCIENCES 12(22):6707–6719, DOI: 10.5194/bg-12-6707-2015. It has been a busy summer for our NERC-funded project RELATED (that stands for Restoring Ecosystems by Linking Aquatic and Terrestrial Ecological Dynamics). The project aims to test experimentally whether the productivity of aquatic food webs increases with the quantity and quality of terrestrial organic matter deposited in nearshore delta habitats. It builds on our previous work that showed forests fuel the growth of juvenile fish by subsidizing the base of the aquatic food web. RELATED will also feature much more work on unlocking the microbial ‘black box’ at the base of the food web as well as better understanding how greenhouse gas emissions might change with surrounding vegetation. Inland waters are major sources of atmospheric carbon and predicting their responses to future change is of major interest (some great recent work here, here, and here). We’ve now just finished launching the experimental platform behind RELATED. Over the last 8 weeks, we’ve had a team of 8+ working tirelessly to submerge artificial lake sediments in 3 lakes. This has involved collecting, mulching, and sifting organic and inorganic materials, mixing these at an industrial scale, and outfitting nearly 300 mesocosms with the appropriate sampling gear. By replicating our experiment in 3 different lakes, we’ll be able to study terrestrial-aquatic linkages along gradients in eutrophication and climate change – the main drivers of change in the world’s inland waters. We’ve also had excellent student help from Laurentian University’s School of Architecture work to design and build a network of sampling platforms that will allow us to work without disturbing our sediments. Artificial sediments with increasing organics from left to right. Joanna Wolstenholme, a third year NatSci undergraduate, has just wrapped up seven weeks helping our field campaign in Canada. She authored this entry, describing her experience. Sudbury, on first inspection, is a rather spread-out mining town, inhabited by many trucks (most of them blue). However the more you explore, the more remarkable the town becomes. It is one of the few areas of the world where remediation has really worked, and the next generation will inherit a greener and cleaner city than the one that their parents inherited. This remarkable change, from a barren ‘moonscape’ caused by years of acid rain (Sudbury was once the world’s largest point source of sulphur dioxide emissions, thanks to large-scale nickel and copper mining), to an area with burgeoning forest cover and recovering lakes, is a great success story that the area can be immensely proud of. 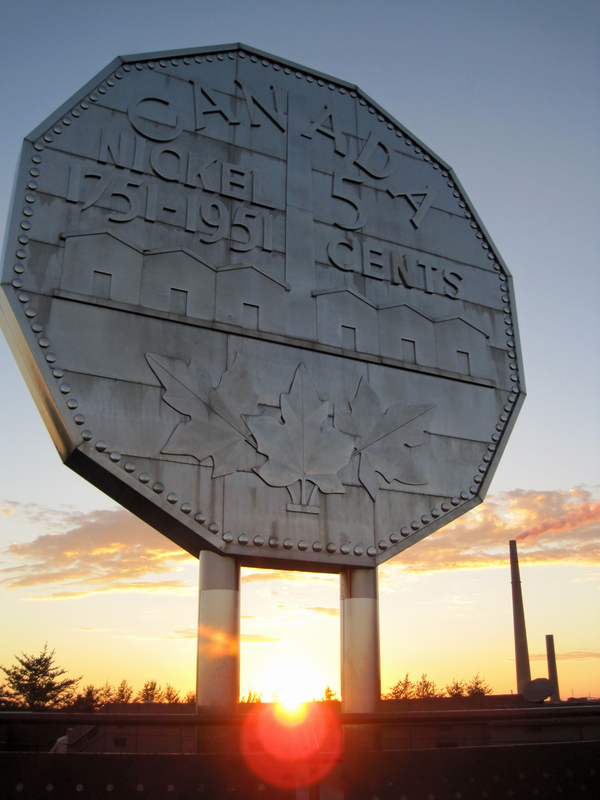 With this backstory, Sudbury, with its 330+ lakes, makes an ideal experimental location for a group dealing in ecosystems and global change. Our study lake, Daisy Lake, is perfectly set up for studying the effects of terrestrial influences on aquatic ecosystems. Along its length, the shores and wetlands have recovered to various degrees. One catchment has even been limed – covered with calcium carbonate to neutralise the acidic soils, and so plant growth is relatively lush. Other areas, closer to the smelter at the north end of the lake, are far more barren; bare, stained rock predominates, with a few stunted trees. In Daisy, we were studying eight stream deltas, each with very different personalities. At each site Erik and I measured algae, sediment, and water. This all sounds very easy in theory, but in practice (as with any fieldwork, as I came to learn) things were far harder and more complicated… and often involved some rather novel solutions. If nothing else, this placement has certainly given me plenty of opportunities to stretch my problem solving skills! My first job was to build algae-collectors, which were plastic tubes with cut up swim floats attached from which 6 microscope-slides dangled from fluorescent string. 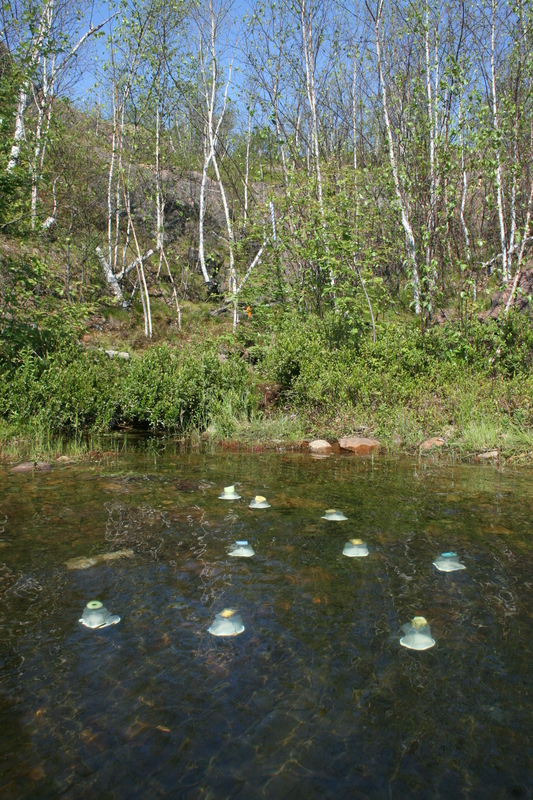 These floated on the surface, but we also sank clay pot holders as another surface for algae to grow on. We left these in the lake (on a beautiful sunny day) at each of the deltas and then returned to collect them 3 weeks later. On a more high-tech note, we also made use of two chlorophyll fluorometers to characterise the algal species found in the water column and benthic layer. After several dry runs measuring the amount of algae on Erik’s office floor, we took them out to the lake, and used them at each of the deltas. The unseasonal amount of rain that Sudbury was experiencing, however, complicated things, and meant that in some sites Erik had to swim with the fluorometers, as we couldn’t reach the sediment from the boat. As well as working on Daisy with Erik, I also helped Andrew collect additional data for his survey of terrestrial resource use by aquatic organisms. This meant going out to six other lakes around Sudbury, and six down in the Muskokas, to collect water samples, use fluorometers, and deploy and collect the microscope slide contraptions. Key to the project was collecting clean leaf and algal samples, to go off for stable isotope analysis, to allow Andrew to calculate the influence of the terrestrial systems on the lake ecosystems. In order to grow clean algal samples without the influence of terrestrial DOM, we collected water from each of the lakes, then filtered it into jars and re-inoculated each jar with a small amount of unfiltered lake water, from which we hoped the algae would regrow. This seemed simple in theory, but involved hours of standing by a vacuum pump watching water drip through a filter. One night, we actually filtered water outside a hotel, so as not to set the fire alarms off! Safe to say we got many odd looks. 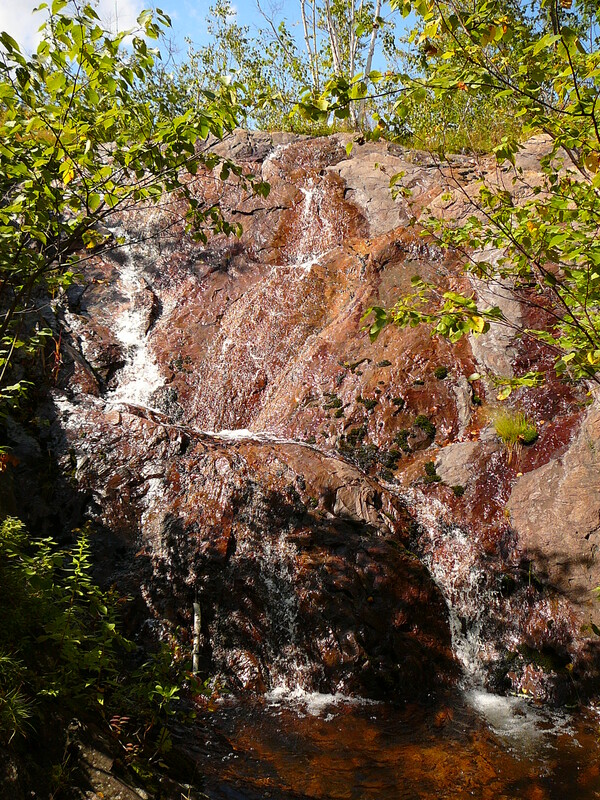 However, the field trip down to the Muskokas was one of the best perks of the summer. We went down in September, almost at the peak of the colours changing, and had two lovely dry but crisp days. Driving down dirt tracks through beautiful forest, to find beautiful lakes to paddle out into was great fun, and a real adventure! It definitely offset the tedium of filtering. At the end of my seven weeks here I am very sad to be leaving. It was a great experience, with plenty of messing about on boats, exploring new places, and making new friends. I have learnt a lot about the complications of fieldwork, how to solve problems on the fly with limited supplies, and just what really goes on behind those simple sounding ‘Materials and Methods’. This article is also published on PLANeT. Joanna’s trip was supported by funding from the Department of Plant Sciences and NERC. Our latest paper has just been made freely available in Nature Communications, showing that freshwater fish, an important source of nutrition for humans, are in part produced by forests. The study focuses on small boreal lakes, which contain upwards of 60% of the world’s freshwater. 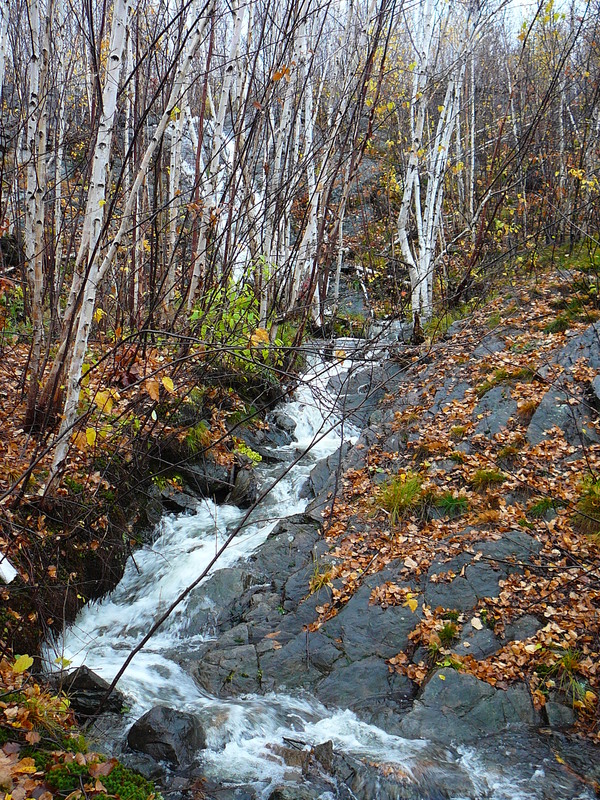 It suggests that any reductions in forest cover in the boreal ecoregion, such as from industrial activities, will threaten the production of healthy fish populations. Small streams that drain forest floors bring microscopic particles of vegetation and soil into water. These get broken down by bacteria, which are then eaten by small invertebrate animals that are main food source for small fish. The research uses a gradient of forest cover in Canada to show that more of this forest organic matter is brought into lakes as the surrounding landscape is vegetated. This produces more bacteria in the near-shore water, which can support more zooplankton, and thus provide more food to small fish. Young fish survive winters and escape predators better if they are larger, so these effects are predicted to carry forward into larger and older animals. The research also uses natural variation in the molecular mass of primary production from land versus water to estimate the proportional of terrestrial resources used by fish. At least 34% of fish biomass was supported by terrestrial vegetation, increasing to 66% with greater forest cover. This suggests that fish increasingly use forest food subsidies as they become available in the small nutrient poor lakes that are characteristic of the boreal ecoregion. You can read more about the work at the BBC, Planet Earth, weather.com, Al Jazeera America, or even watch a video at the Weather Network. It is great to see the work receive this type of reception! It took over 2 years of my life to produce in collaboration with a number of colleagues mainly at Laurentian University’s Living with Lakes Centre.